Death notice for Tristan da Cunha islander Lewis Glass, who passed away 19th February 2019, aged 70. We are sad to announce the passing away of Edward "Lewis" Glass at 3:00pm on the afternoon of the 19th February 2019, aged 70, after a short illness. Lewis was a member of the Island Council for many years. He was Chief Islander from 1991 to 1994, and was acting Administrator for short periods during this time. 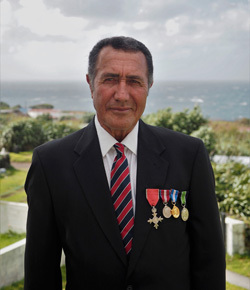 He was appointed MBE in the Queen's Birthday Honours in June 1995 for services to the dependencies of St. Helena.